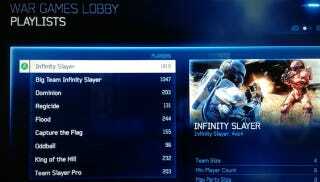 We're up to 4,294 people playing Halo 4 online right now-at least. We can't co-op, but we do have the breakdowns for competitive multiplayer and the story based Spartan Ops. Yesterday, there were at least 495 people playing the game online. This is a nine-fold increase. Halo 4 will be officially released on November 6. This is how it goes for pretty much every popular video game. If you're playing Halo 4 on release day on the Xbox 360, you'll be meeting some players online who've got a few days on you.